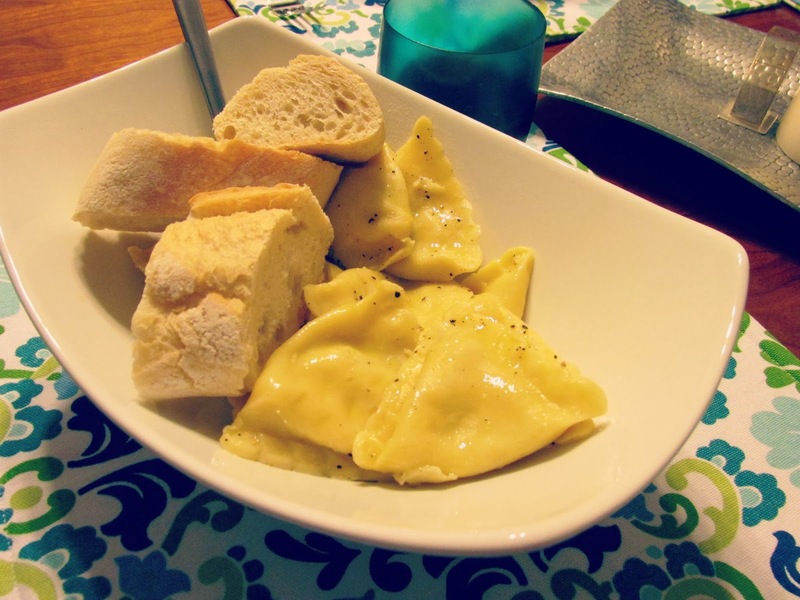 Ravioli is one of those simple, inexpensive meals that I love. 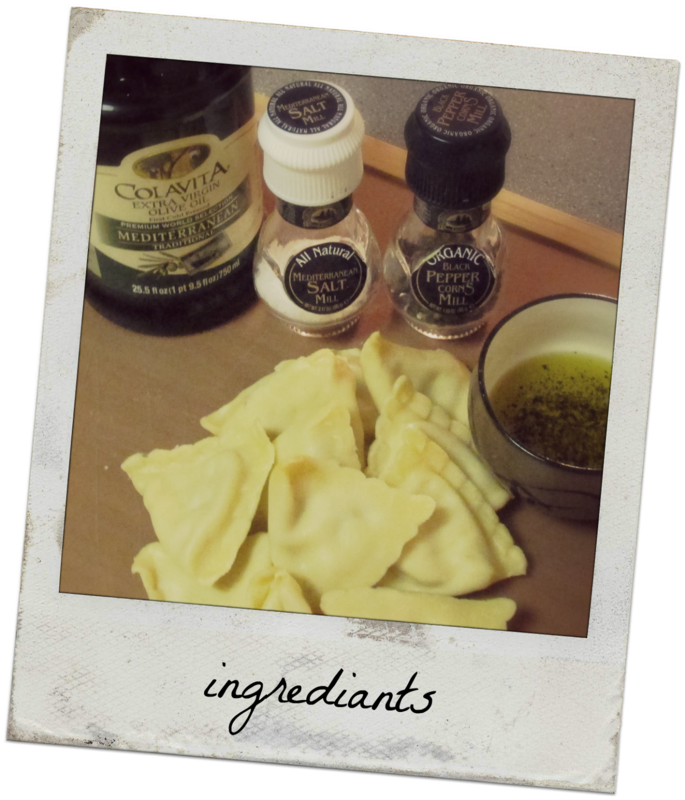 Purchasing the ravioli itself is the only expense as I already have everything else at home: olive oil, salt, pepper. Honestly you could use any ravioli at all! 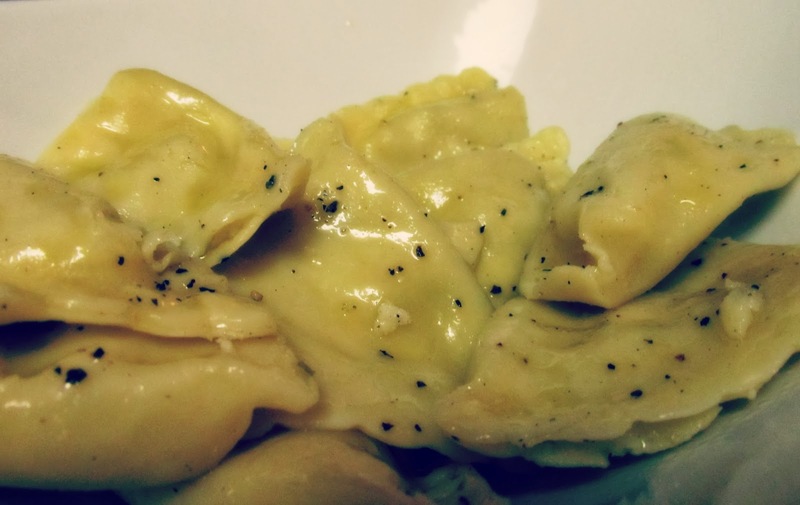 I love this particular ravioli from Costco though. It is one of their staples, meaning it has managed to stay in stock at Costco for over two years. For those who haven't noticed, Costco is constantly re-vamping their stock, you never know what will be there from month to month. 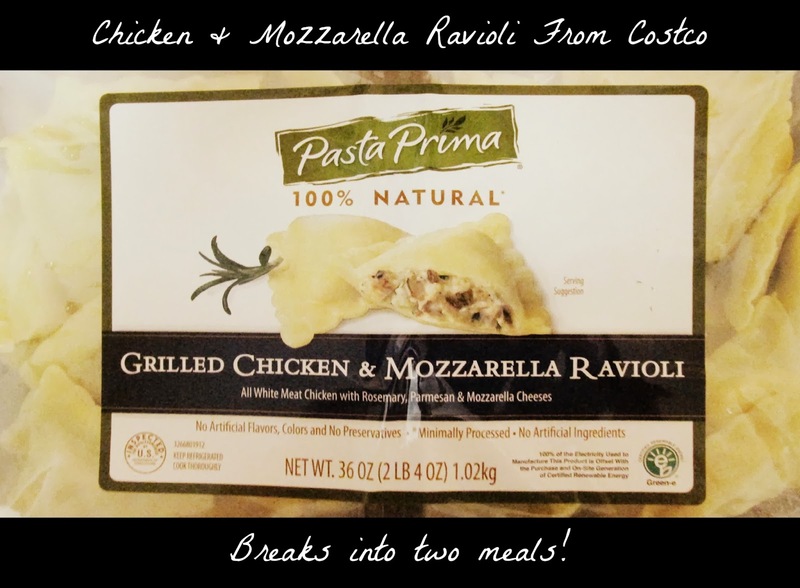 One great thing about the Costco ravioli packets is that the packages are divided into two separately sealed packages. That's perfect for Hubby and I as there is no way we could eat the whole thing in one sitting. The cooking instructions are very easy and listed on the back of the packaging. It only takes 4 minutes to cook these babies! No time wasted here. Rather than adding sauce I like to mix together olive oil, a small amount of salt, and several twists of fresh ground pepper. Then I strain all the water away from the noodles so that the pot they are sitting in is relatively dry. I drizzle the oil mixture over the top and then gentle toss the noodles so the oil evenly coats all of the ravioli. I use a noodle strainer to transfer the ravioli into the separate bowls. Be gentle so as not to accidentally break them open. Serve with bread or a salad of your choice. Add a glass of wine and you're done! Bon Appétit! I love your idea of olive oil and just seasoning for the sauce. Sometimes I think the other ones are just too thick, or too much! Thank you! I agree completely, I like thick sauces are great for plain noodles, but ravioli already has so much flavor its a shame to cover it up. I hope you found something delicious! :) The coats in your post are beautiful! Thank you,I always looking for new inspiration to cook! Yum that looks delicious! Love your blog, would you like to follow each other? Thank you! I'll be sure to check yours out! Can I just say that I'm craving this for dinner tonight! You made it look amazing and I'm sure it tasted just as good! OMGODDD THOSE LOOK AMAZING!& in 4 minutes?! sold! sold! & sold! Haha, thank you! I hope you get the chance to try it out! I hope you like it! It is extremely easy to make! I hope you find them! I've found them in both Washington and New Mexico, but sometimes different Costcos have different items. If you can't find these specific ones, though, any ravioli will work! Thank you so much! Haha, I know! I get very confused people all the time. When I'm making appointments for the two of us at the same place I will frequently use my second name (Michelle) so that it's less confusing. Thank you! I can't wait to check out your blog!